We all know the things we “should” do. Most of the time when we go to friends or family with problems we are seeking support and validation and not to have someone who hasn’t walked in our shoes sit there and tell us what to do. When I go to my primary care doctor I already know I need to eat healthier, sleep more, and exercise. When I talk to my husband about problems at work, I already know I need to have some difficult conversations with my co-workers or boss. Most of the time, we already know. When we set a goal, we already have an idea of what it will take to get there. I know if I want better sleep I have to lay off the tv binging at night. I know if I want to make friends, I have to actually do something that involves speaking to others. I know if I want to better manage my anxiety, I have to nurture a daily practice of self-care such as meditation. I know this, you know this. So why is it sooo hard to make the change?! Why do we start and stop, and fall off the wagon over and over again? Now there are a million different ways to approach why it is so hard to make changes. 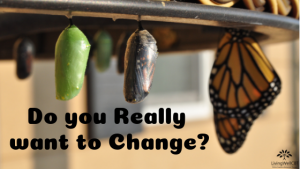 From habit loops, conditioned responses, to engrained neural pathways, to myths about willpower, to stages of change, etc… But today I want to focus on one simple question, do you really want to change? You probably have a great list of all the benefits of changing, but have you taken the time to honestly look at the list of all the reasons you have to not change right now? When I was in graduate school I wanted to lose weight. We all heard this story before. So I convinced myself it was not about the weight but I simply wanted to eat healthier so I could be healthy. Healthy is good right? During a group exercise in one of my classes our professor asked for someone to share an example of a goal they had. I volunteered and I said I want to eat healthier. She walked me through all the reasons why I wanted to and then asked me why I haven’t done it yet. That’s when all of the “yes… but’s” started. I want to eat healthy but I don’t know how to cook. I want to eat healthy but I don’t have time to cook, time to learn, time to grocery shop. I want to eat healthy but I don’t like the taste of anything I’ve tried, etc… The list went on and on. She then asked me why don’t I have time? What is more important to me that I don’t have the time to learn how to cook healthier? She asked me to think about my priorities and what the benefits were to me of not changing anything right now. I listed a whole bunch of school projects, work assignments, and other responsibilities that were all more important to me at the time than eating healthy. Ultimately I realized that I had to give up something else in order to make the space in my life for healthy eating (I know many of you are thinking ‘but it is so easy just replace one unhealthy item at a time’ etc…, I get it, but I didn’t even have the headspace at that time to think about what and how to start replacing the unhealthy things in my life). I remember saying, “It is more important to me right now to get an extra hour of sleep than to spend an extra hour meal prepping.” That was my aha moment. That was my priority. When I was really honest with myself, I did not want to change what I was doing. The quick and easy ramen was what fit into my lifestyle and my priorities at that time. I felt such a release of burden. I stopped beating myself up and criticizing myself for being to weak to make changes, for never keeping up with the healthy eating for more than a few days at a time. I let go of feeling like a failure because I couldn’t figure out what every one else was telling me was so easy to do to eat healthier. That freed up so much mental energy and space in my life and I felt my mood lift and my anxiety go down (this is part of the Acceptance process in Acceptance and Commitment Therapy ACT). 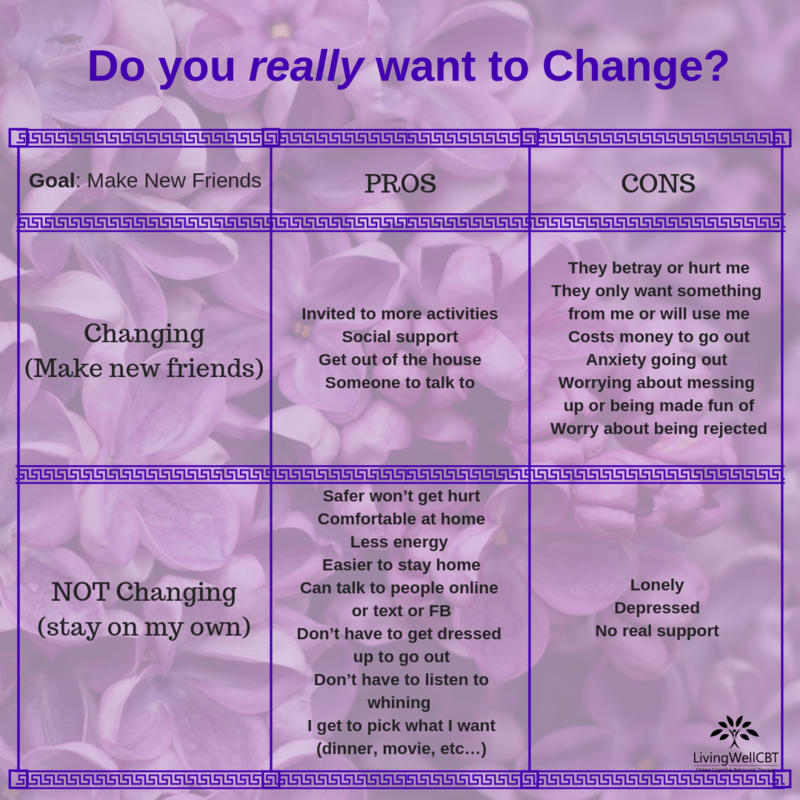 What are the benefits of NOT changing? Since then my priorities have changed several times. 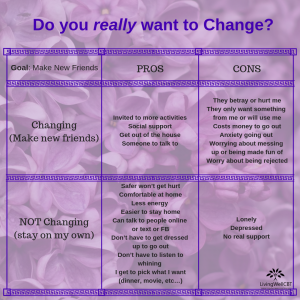 But whenever I find myself beating myself up for not living up to my goals and standards of what I believe I “should” be doing, I remind myself to review my priorities and values and get real honest with myself about the benefits of doing nothing, of not changing. We’ve all done the Pros and Cons of making a change. But we don’t usually step back and look at the Pros and Cons of doing nothing, not changing, and just leaving things as they are. As long as the Pros of Not Changing outweigh the Pros of Changing, guess what, you don’t really want to change. (Waiting until we “want to” vs. “just doing” something is also a discussion for another day, the goal here is to focus more on the underlying thoughts that keep us stuck.) In this example, I still value the ease and safety of being home on my own more than I value going out to activities and having people to talk to. Until I value making the social connections more than I value the feeling of safety, comfort, and ease, I am going to have a real hard time changing anything. We often focus on the cons, I want to make new friends because I don’t want to be depressed and lonely. But this isn’t enough to promote change (think back to the effectiveness of various anti-drug campaigns). I’m already lonely, I’ve been dealing with it already, and it is what I know and am familiar with. Making small talk with others and going out, now that is new and scary, and that will take a lot more energy and effort. When I get stuck in the circle of “I should make new friends but…..” I might also make my depression worse by then beating myself up and feeling guilty for not changing and socializing more. So what do we do? The goal here is to focus on your priorities and values, and either re-evaluate your values, or try to find other actions that align with those values. 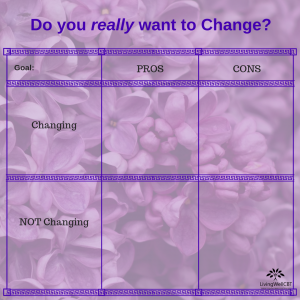 So try it out on your own, use the template below to think thru one of the things you’ve been wanting to change in your life that perhaps you have been beating yourself up over for not doing it or not sticking with it. And then practice some self-compassion and acceptance for where you are in your life at this time and what your current priorities are.